The Rajesh Gopinathan-led company reported a 20.8 per cent year-on-year (YoY) increase in its revenue at Rs 37,338 crore while constant currency revenue grew 1.8 per cent QoQ and 12.1 per cent YoY. 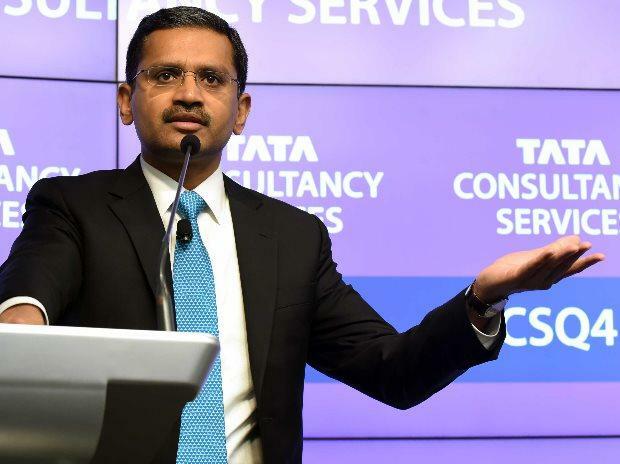 Leading IT Services company Tata Consultancy Services (TCS) released its financial results for the third quarter (October-December period) of the current financial year 2018-19 (FY19) on Thursday. The company reported a double-digit revenue growth during the period led by BFSI and digital segments. Solid growth in the UK and Europe business, boosted performance, said the company. The company said its performance had been good and its operating margins were resilient. "Despite headwinds from the Rupee volatility against various currencies, and the higher cost of doing business in some major markets, our operating margins have been resilient. We remain focused on driving rigor in our operations, generating strong cash flows and steering profitability back to our preferred range, while continuing to invest strongly for future growth," said V Ramakrishnan, Chief Financial Officer. The Rajesh Gopinathan-led company reported a 20.8 per cent year-on-year (YoY) increase in its revenue at Rs 37,338 crore while constant currency revenue grew 1.8 per cent QoQ and 12.1 per cent YoY. Operating margin came in at 25.6 per cent, a growth of 0.4 per cent YoY. Net income or PAT (profit after tax) rose 24.1 per cent YoY to Rs 8,105 crore. On QoQ basis, the figures grew 2.58 per cent. The company also announced an intertim dividend of Rs 4, record date of which has been set at January 18, 2019. January 24 has been fixed as the Payment date. Earnings per share (EPS) during the said period was at Rs 21.60, up 26.6 per cent YoY. Revenue growth accelerated in all the geographies compared to Q2, the company said in its press release. Growth was led by UK (up 25.1 per cent), Europe (up 17.6 per cent), and Asia Pacific (up 12.6 per cent). North America grew 8.2 per cent, India grew 9.7 per cent and Latin America grew 7.6 per cent. TCS said loT (Internet of Things), TCS Interactive and Cyber Security had an exceptionally strong quarter. - loT saw strong growth and deal wins around digital twin, fleet management and energy management solutions. - Cyber Security services saw strong growth around managed security services, identity and access management and governance risk and compliance. TCS added a total of 6,827 employees during the period, taking the total employee strength at the end of Q3 to 417,929 on a consolidated basis. The company continued to invest heavily in organic talent development. These initiatives resulted in employees logging a cumulative 14.2 million learning hours. Over 292K employees have now been trained in digital technologies, and over 318K employees in Agile methods, it said in its press release. The IT Services attrition rate (LTM) stood at 11.2 per cent. - It has been selected by a large Brazilian bank as the primary vendor for digital transformation and innovation leveraging TCS expertise in digital channels, user experience and design capabilities. - Awarded a multi-year, multi-million dollar contract by a global hospitality chain to be the IT transformation partner. - Engaged by a leading Malaysian oil and gas company as a consulting partner to design and deliver an enterprise visualization platform that provides visibility and greater business insights across the entire value chain. TCS will also offer digital learning-as-a-Service for managing organizational change and employee alignment to the transformation initiative. "The company’s topline growth and margins were impacted by cross currency headwinds, poor performance in BFSI and higher employee cost. Going forward, we believe macro uncertainty could remain an overhang," said ICICIdirect in its note post result announcement.